Officers…swooped in on five people, three of whom were wearing zombie make-up, when they entered a branch of Starbucks on Oxford Street. They were arrested “on suspicion of planning a breach of the peace”. They were all handcuffed and held in a police van and gave their names as Amy Cutler, 25, Rachel Young, 27, Eric Schultz, 43, Hannah Eisenman-Renyard, and Deborah, 19, an anthropology student at the University of East London. 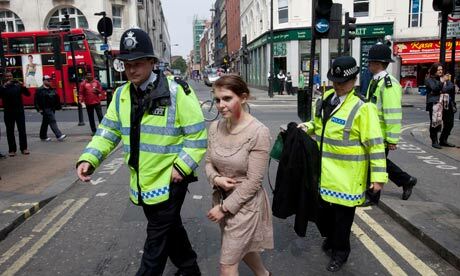 Here’s an interview with Amy and some of her fellow zombies post-arrest. While some people may find a bunch of zombie kids getting arrested (and released) for “potential breach of the peace” (Minority Report style) might seem insignificant in the grand scheme of things, as Amy puts it in the interview, “the fact that it appeared to be legal to put us away for the way I chose to be dressed” is more horrifying than anything George Romero has dreamt up. I was going to say “except for that zombie baby,” but Zach Snyder’s to blame for that one. This entry was posted in Haters be Hatin' and tagged freedom of speech, protest, royal wedding, tyranny, zombies. Bookmark the permalink.